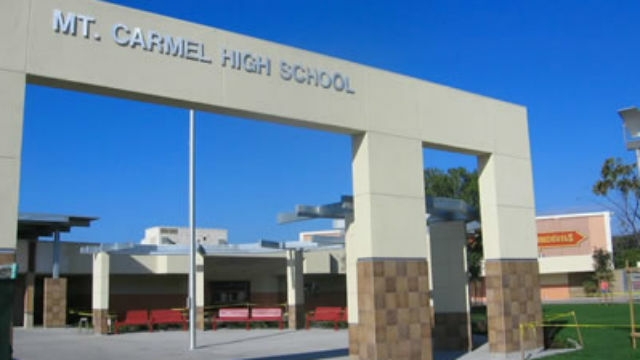 A student allegedly brought a screwdriver to Mount Carmel High School Thursday and threatened to harm other students, prompting a lockdown at the Rancho Penasquitos campus. Dispatchers received a call shortly after 7:30 a.m. from a person reporting that a male student had brought a screwdriver to campus and threatened to harm himself and other students, San Diego Police Lt. Brent Williams said. The student also reportedly began chasing students while holding the screwdriver until staff members made contact with him and stopped him, Williams said. A staff member suffered a minor hand injury while stopping the student, the lieutenant said. Officers arrived at the campus, made contact with the student in the school’s auditorium and he was taken into custody around 8:05 a.m., SDPD public affairs Officer Billy Hernandez said, adding that the school was put on lockdown during the incident. The Poway Unified School District sent an email to parents around 8:05 a.m. notifying them of the lockdown and asking them not to come to campus. At 8:20 a.m. school officials sent a second email to parents, notifying them that the student was in custody, no one was injured and officers were clearing the scene. School officials informed parents around 9:15 a.m. that the lockdown had been lifted, but the school remained on “secure campus,” meaning students were required to remain inside their classrooms until police gave the all clear. Shortly before 10 a.m., school officials announced that the secure campus status was lifted and the school day would continue as normal. Parents wishing to pick up their children were advised to arrive at the gates at the front of the school, where they would be taken to the attendance office in small groups. The juvenile was being held for a psychological evaluation and could face several charges including making criminal threats and brandishing a weapon, Williams said.